Nice Toon! You seemed to lay off your older exaggeration of the mammaries, but great hair. Reminds me of a female version of 'Linc' of the Mod Squad! Hepburn new where her bread was buttered! I thought the quote to be ironic, taking into account her own considerable charms. It wasn't like she was Bella Abzug, or anything. I read the quote and immediately thought of Firefall's "You Are the Woman:"
"... The beauty of a woman is seen in her eyes, because that is the doorway to her heart, the place where love resides. True beauty in a woman is reflected in her soul. It’s the caring that she lovingly gives, the passion that she shows and the beauty of a woman only grows with passing years.” - A. H.
The gist of what she was saying is, "Animal attraction isn't everything." Favoring the visual in deference to the mental & spiritual can lead to [avoidable] lifelong headaches/heartaches (which I'm sure everybody here already knows). Them big ol' breasteses look plenty exaggerated to me (which is OK, but I'm indifferent to; to me size matters not). The giant 'fro just deemphasizes them. 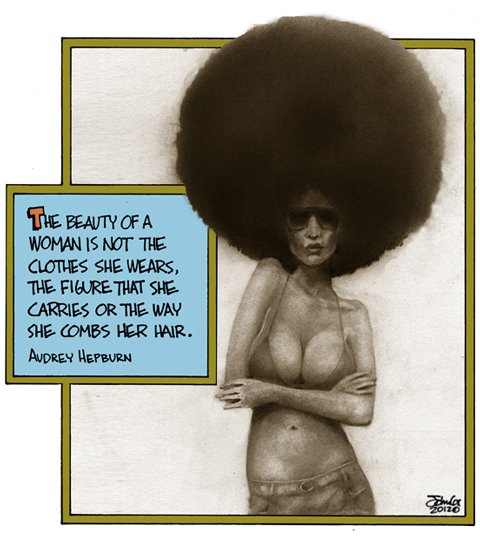 My first thought [at the illustration] was Cindy Blackman--underrated drummer, seems to have a sweet spirit, & easy on the eyes. I'd like to hear her play in an old school trio. Bella Abzug! Wow - there's a memory: fitting name for a congresswoman who had the build (and the charm) of a Soviet T-34/85 tank. This page contains a single entry from the blog posted on October 3, 2012 12:01 AM. The next post in this blog is Wooing The Middle.